Utrecht is almost 2,000 years old and was created as a fortress by the Romans. It then formed the northern border post at a fordable location (Utrecht) downstream. On the spot where Graaf Floris is located, the Romans built a Castellum. Around 1100, the course of the Rhine was channelled by the construction of the Oudegracht, which formed part of the important route from Amsterdam to Cologne. By damming the Rhine at Dorestad (currently: Wijk bij Duurstede) the water level dropped and, at that level, yards and cellars could be built. These two levels on the canal are unique in the world. In order to maintain the important route, the Vaartse Rijn was dug and the centre was raised using that sand. In 1122, Utrecht received city rights and around the city a defense ditch was dug and a wall was built. The city developed over the centuries as an important trading centre. Utrecht was also a very important Catholic stronghold for a long time. As in Rome, five churches were built forming a crucifix, of which Dom Tower was the centre. There were also numerous monasteries of different orders. 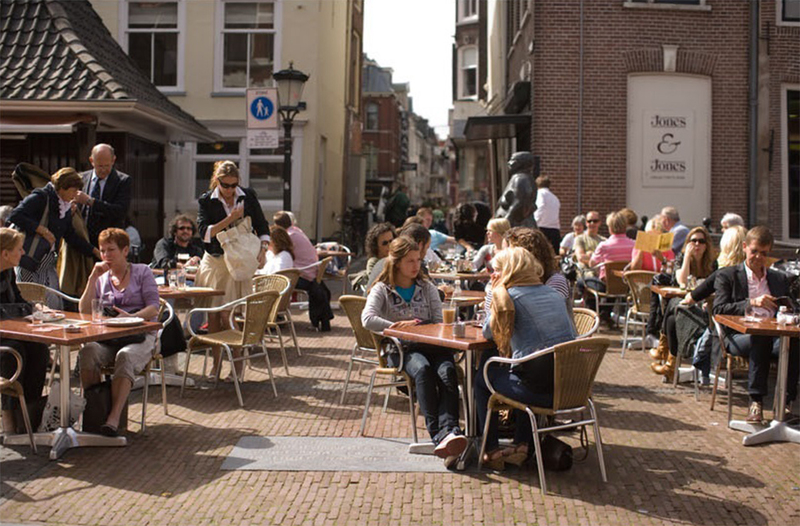 Nowadays, Utrecht is an international leader in terms of culture, shopping, dining and sightseeing, and the Graaf Floris Café Restaurant is the ideal place to meet. In the 13th century, fish were traded in the fish market located on the Kalisbrug, and continued until the 1930s. There were hard, stone pot banks on which fish were salted and sold. Three of these banks have been preserved. The fish were kept fresh in baskets hanging in the canal. In our building, five generations of the Engelman family have operated a fish store. Jan Engelman, a writer and poet, and a descendant of that generation, was born here. A plaque with one of his poems is inscribed on the bridge for Graaf Floris. Until 1972, bras and corsets were sold by corsetiere, van Buuren, where the fish of the Engelman family once lay. The building was then converted into the current café restaurant. The benches and paneling come from the demolished Monica church. A sculpture of a market woman with roosters under her arms (by Theo van de Vathorst) adorns the bridge near the Hanengeschrei. For many years there was a busy stamp and coin market every Saturday at the Vismarkt. With a height of 112 meters, the Dom Tower is the highest church tower in the Netherlands, and the tallest building in Utrecht. The Dom Tower was built over a period of about 300 years, from 1254 to 1517. The middle part of the cathedral was destroyed in a violent storm in 1674. The Dom Square is now located on that spot. If you want to take a good look at this beautiful tower and see the city of Utrecht from above, you can climb the Dom Tower via the 465 steps. There is no elevator, so using stairs is the only way to get to the top. There are several rooms in the tower, and halfway up you can see the monument’s bells. These bells of the seventeenth-century Hemony carillon sound regularly over the city, played by the city carillonist. From 70 and 95 meters you have a beautiful view of the city and the province of Utrecht. When climbing the tower, a guide is recommended, who will also provide historical details of the Dom Tower and Dom Church. 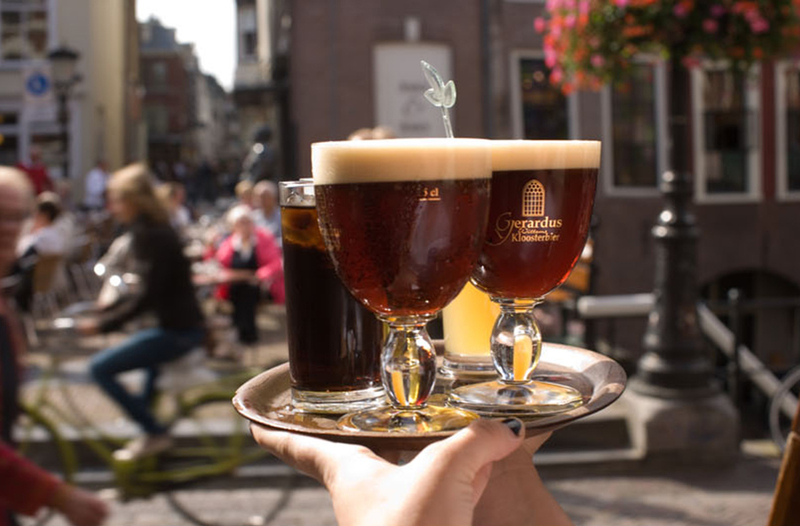 The Dom Square, with the Tower and Church, are just around the corner from the Graaf Floris Café – Restaurant. In addition to the many flights of steps and numerous nice terraces, cafés, clubs, theaters, (pop) stages, film houses and musical performances, Utrecht is a cultural city that has many festivals, events and fairs. Why not combine a fun day or evening with a visit to the Graaf Floris Café Restaurant! Utrecht, situated in the middle of the Netherlands, is rightly the favorite city of many people. Shopping in the city is par excellence, with a compact and attractive centre. 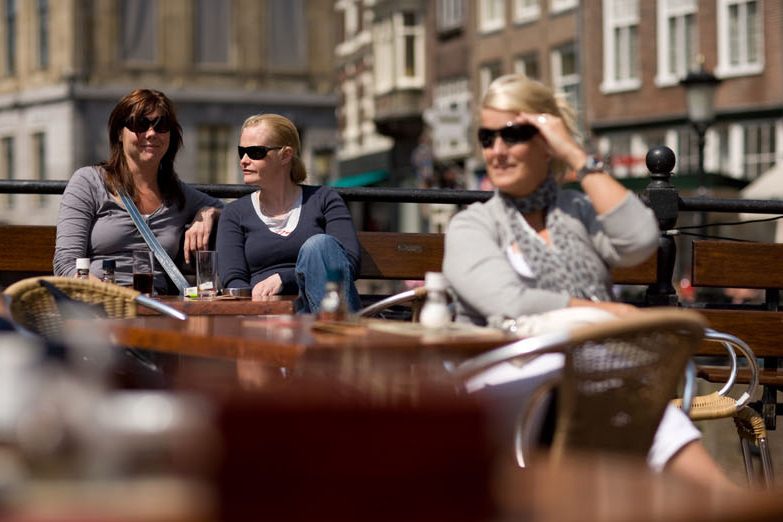 The old buildings and picturesque streets form a beautiful backdrop for a day of shopping in Utrecht, visiting museums, having lunch, drinks or dinner on one of the many terraces or in various catering establishments. A very special attraction along the canals of Utrecht is that visitors can descend below street level and discover 2000 years of Utrecht history. The varied range of shopping options include nice gift and specialty shops, special furniture and antique shops, and chic, trendy and vintage clothing stores. Everyone will be able to enjoy an afternoon shopping in the many pleasant shops in Utrecht. 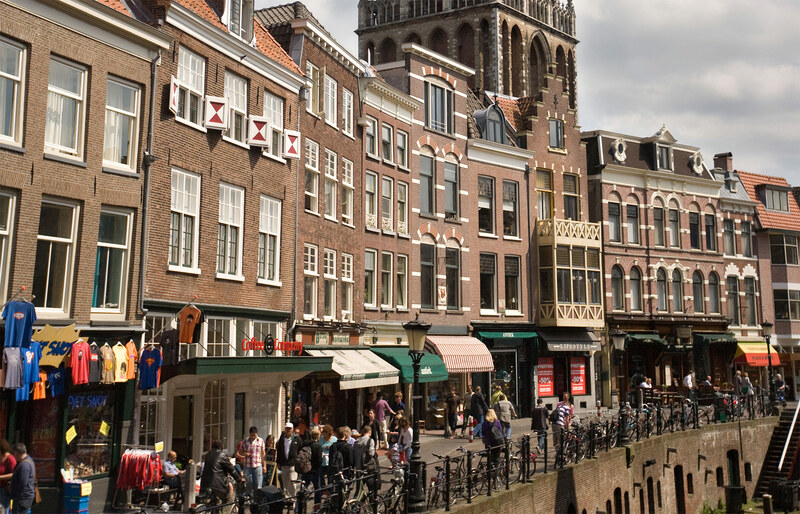 Some of the excellent shopping streets include; Steenweg, Oudegracht, Oud Kerkhof, Ganzenmarkt, Minrebroederstraat, Lange Elisabethstraat, Lijnmarkt, Zadelstraat, Vismarkt, Choorstraat, Schoutenstraat, Neude and the Vredenbrug.